In 2012 the Millennium Wildlife Area was given a complete makeover. This introduced new user-friendly pathways, more wildlife habitats and extensive planting. 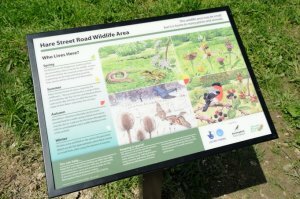 It is located at the eastern end of the Hare Street Road Recreation Ground. Access is from Snells Mead, Carter's Close or via the footpath next to the last house on the south in Hare Street Road.